Take advantage of this unique opportunity to discover the artistic side of Leonardo da Vinci through his Milanese works. The Sala di Leonardo at Pinacoteca Ambrosiana, the famous Last Supper at the Church of Santa Maria delle Grazie and the “Atlantic Codex”. 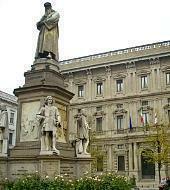 An unmissable voyage back in time in Leonardo da Vinci footsteps around Milan. Your tour begins with the "Sala di Leonardo" and the Atlantic Codex, the most extensive collection of Leonardo’s manuscripts; it contains studies covering mathematics, anatomy, botanic, machine design, studies on the flights of birds and architectural projects. You will then continue to the Church of Santa Maria delle Grazie, where you will admire The Last Supper, Leonardo da Vinci's masterpiece. Housed at Santa Maria delle Grazie, the Last Supper has earned a spot on the UNESCO World Heritage list. With our walking tour you will get skip the line tickets guaranteeing you exclusive no line entry and an intimate viewing of the famous painting. 17.00: Walk to Santa Maria delle Grazie Church and Visit of Leonardo da Vinci’s The Last Supper. 19.00: Tour ends at Santa Maria delle Grazie church. Visit the "Last Supper" guaranteed.